American Mineralogist (Am Min), is the flagship journal of the Mineralogical Society of America (MSA), continuously published since 1916. Preparations have already begun for our 100th anniversary celebrations, stay tuned! Am Min is home to some of the most important advances in the Earth Sciences. Our mission is a continuance of this heritage: to provide readers with reports on original scientific research, both fundamental and applied, with far reaching implications and far ranging appeal. Topics of interest cover all aspects of planetary evolution, and biological and atmospheric processes mediated by solid-state phenomena. These include but are not limited to mineralogy & crystallography, high- and low-temperature geochemistry, petrology, geofluids, bio-geochemistry, bio-mineralogy, synthetic materials of relevance to the Earth and planetary sciences, and breakthroughs in analytical methods of any of the aforementioned. We hope you are interested in submitting an article. Please click on the menu bar above and explore our tools and instructions to authors. Our Scope and Mission link explains about the many paper types. Top Ten Submission Tips Here. We hope you will bookmark this page and use the information we have gathered to help researchers and scientists discover exciting new information about Earth Sciences. If you are already a subscriber, please visit www.msapubs.org to find your correct log on. Figure 1. 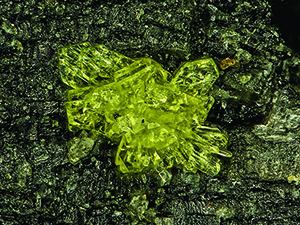 Meyrowitzite on asphaltum. The field of view is 0.5 mm across. Submission to acceptance time averages about 3.5 months. Letters papers submission to acceptance time averages less than 2 months.